The Yukon NVMT Spartan 2x24 Night Vision Scope is capable of being submersed in at least 3-feet of water for at least 24 hours without any damage. They are ideal use under extreme weather conditions such as rain, snow, dirt and dust. 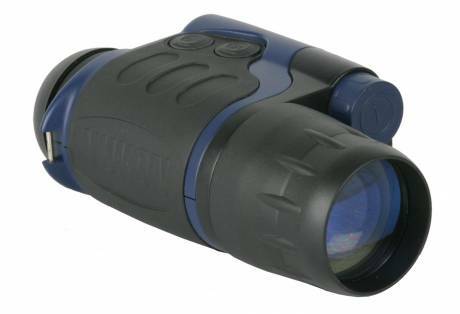 Yukon engineered the NVMT line of night vision monoculars to be lightweight, compact and surprisingly affordable. It's perfect for the outdoor enthusiast to take from a sporting event to a hunt. Yukon's exclusive PULSE system Infrared (IR) Illuminator provides infrared lighting for an enhanced image, while staying invisible to the human eye and animal's eyes. The PULSE system utilizes quick IR energy bursts that penetrate further to increase distance, visibility and image quality, without significant battery drainage or untimely IR burnout. The ergonomically designed, durable, RUBBER ARMOR body fits comfortably in the palm of your hand and can fit in your pocket for those quick escapes. It's perfect for travel and prolonged use. The body of the Yukon NVMT-1 2x24 WP Night Vision Scope is absolutely waterproof and keeps working even after complete submersion into water. The NVMT's newly developed lenses maximize light amplification through improved frequency/contrast characteristics.